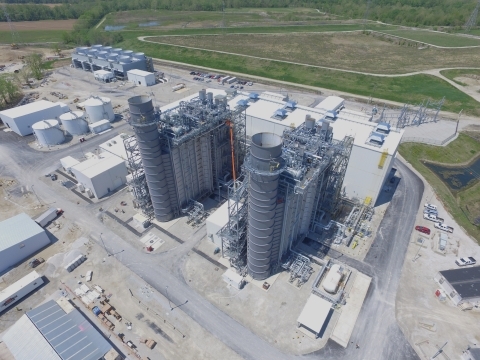 Indianapolis Power & Light Company (IPL), a subsidiary of The AES Corporation (NYSE: AES), announces a historic milestone has been met as the 671 megawatt Combined-Cycle Gas Turbine (CCGT) natural gas plant reached substantial completion and began commercial operations on Saturday, April 28, 2018. The completion of IPL’s Eagle Valley Generating Station, located in Martinsville, Indiana, ensures a more diverse, reliable and cleaner portfolio of generation for customers. The new natural gas plant is one of the cleanest, most efficient thermal power plants to be built in Indiana. Additionally, it reduces the rate of most emissions by 98 percent compared to the six coal- and oil-fired units it replaced. Connected to two interstate natural gas pipelines, IPL’s natural gas plant can access low-cost fuel from most of the major natural-gas producing basins in the United States. IPL received approval in 2014 from the Indiana Utility Regulatory Commission (IURC) to invest approximately $600 million to build the natural gas plant. This project, along with the conversion of coal-fired units to natural gas at IPL’s Harding Street Station in 2016, makes natural gas IPL’s largest source of generating capacity. IPL also added advanced battery-based storage to its fleet, which enables more efficient operations and supports the ongoing integration of renewable generation resources. IPL will host a ribbon cutting ceremony in the coming months to celebrate the commissioning. For more information about the benefits of IPL’s new natural gas plant, visit IPLpower.com/CCGT. About Indianapolis Power & Light Company and AES. Indianapolis Power & Light Company (IPL), an AES Company, provides retail electric service to more than 490,000 residential, commercial and industrial customers in Indianapolis, as well as portions of other Central Indiana communities surrounding Marion County. During its long history, IPL has supplied its customers with some of the lowest-cost, most reliable power in the country. For more information about the company, please visit www.IPLpower.com or connect with us at www.twitter.com/IPLpower, www.facebook.com/IPLpower or www.linkedin.com/company/IPLpower.